We have hosted several events in Vancouver since I became MAPLE’s Business Ambassador to BC in 2017 but this was my first trip down to SoCal for one of their quarterly grouping of three events in San Diego, Los Angeles, and Orange County. On this Wednesday December 4th I head out mid afternoon on one of three daily nonstop flights on Air Canada from Vancouver to San Diego to be fresh for our first meeting at the Bella Vista Social Club and Caffe tomorrow morning at 7:30am. Only three hours gate to gate and no time zone changes, the geographic and time zone proximity between B.C. and SoCal can’t be understated. It is sunny in Vancouver today but only a high of 4c however we will be arriving to sunny skies and 21c in San Diego. Another benefit for Canadians to join the MAPLE events in SoCal during the winter. During this series of events our speakers will be Bernardine Perreira of Perreira Hurly Wealth Advisory who will be speaking on key financial considerations for navigating North-South moves between Canada and the United States as well as Delilah Panio of the TMX Group, who will be speaking about capital opportunities for Southern California high-growth companies. MAPLE typically has the same speakers for each one of their triad of quarterly events. Bernardine has come down from Toronto for the speaking opportunity while Delilah resides in the LA area. It is Wednesday morning and I get up at 6:15 for our event to start at 7:30 about 15 minutes away from my hotel by Uber. The Bella Vista Social Club and Caffe is a beautiful establishment located on the campus of the University of California - San Diego (UCSD) in La Jolla overlooking the ocean. UCSD is quite the catalyst for the life sciences cluster in San Diego with the world famous Salk Institute in immediate vicinity. Breakfast is served at 7:30 and guests, mostly from San Diego roll in, although we had one guest come in as from as far as Oceanside which on this morning was well over an hours drive.. Lots of time to network with the 20+ guests in attendance followed by an hour of formal presentations. Again some time to network after formal proceedings and guests make their way from the Bella Vista at 10am. Our founders Stephen Armstrong and Rob Kelle along with myself pack up all our signage and collateral and head back up to Orange County. It is midday and raining so traffic is very good so we have a few hours break before heading up to Pasadena in the afternoon to set up for next morning. I stay overnight in Glendale which is about 15 minutes by Uber to our venue at the Arts Center College of Design in Pasadena. 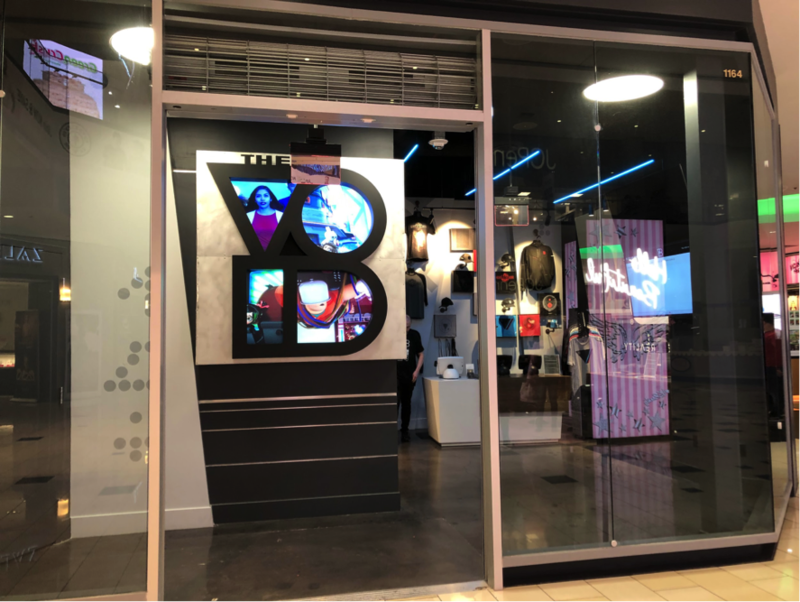 Incidentally if in Glendale you have to check out the outdoor mall, Americana on Brand and if you are game, the Void VR experience at the Galleria across the street. On this occasion, I tried the Ralph Breaks the Internet VR experience but they also had the Star Wars experience ongoing as well. Since Vancouver has one of the largest clusters of immersive technology companies worldwide I felt this would be a great opportunity to educate myself. We arrive at the Arts Center College at 7:30 and unfortunately it ends up being the rainiest day of the year. Despite that, an enthusiastic, albeit smaller, group shows up for breakfast, formal presentations, and we are hosted to a tour of the campus afterwards. The College has many disciplines such as art design, film and tv education, and automotive design; the latter of which has international acclaim. 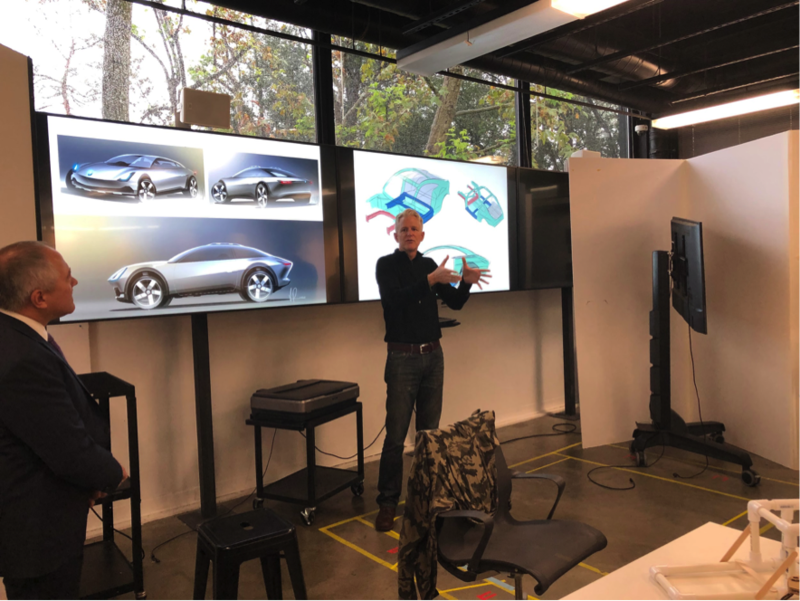 Many of their automotive design alumni hold key positions at major car manufacturers around the world. The tour ends around 11am and we pack up and head out just before noon to set up for the evening event in Costa Mesa. I stay at the Westin South Coast Plaza, Costa Mesa just across the street from Brookfield Residential’s offices in Orange County who will host the evening event. This afternoon, we are trying something a little different. We are going to film our two speakers in a brief snippet about their subject matter expertise and will be making the videos available online. This is something MAPLE will be planning to do for all our events moving forward. Several of our guests from the Pasadena event will also be attending the evening event in Costa Mesa as well despite the unusually stormy weather. Guests arrive at 5:30 for about an hour of networking complimented by drinks and appetizers and we begin the formal session around 7:00. We promptly adjourn at 8:30. Clean up begins shortly after the final guests leave after 9pm and we depart the premises just before 10pm. Overall a very compressed and efficient way of not only meeting new contacts but also getting to learn more about SoCal in general, in part due to the diversity of event locations. Although the core of their attendees are Canadian expats, the MAPLE brand name is really starting to resonate in recognition and we certainly see this as well in B.C. There is truly so much going on in the region and even though I have been to SoCal on many occasions and formally with MAPLE for over two years I find I am both learning something new and meeting new contacts all the time. Thanks to MAPLE I am also beginning to become part of the SoCal business community and opening up the real gratifying opportunity to connect my business networks between B.C. and SoCal. Congratulations to MAPLE’s founders Stephen Armstrong and Rob Kelle, I never realized how much time and effort you put into each one of your quarterly events. Amazingly they also run the parallel group, Canadians in Orange County as well. I hope to be back in SoCal for other MAPLE events soon and would certainly encourage my cohorts in B.C. to come down for future MAPLE events. As is well known of course, there are no shortage of tourist activities in SoCal should delegates from Canada want to mix in some pleasure with business. I hope that sometime in the future we can have a broad congregation of our MAPLE community which includes delegates from BOTH our communities in SoCal and in Canada. I fly out on one of Westjet’s daily flights from John Wayne Airport to YVR the following day just after noon. John Wayne Airport, located in Santa Ana is one of the nicest airports in the U.S. and super convenient if you are visiting Orange County.